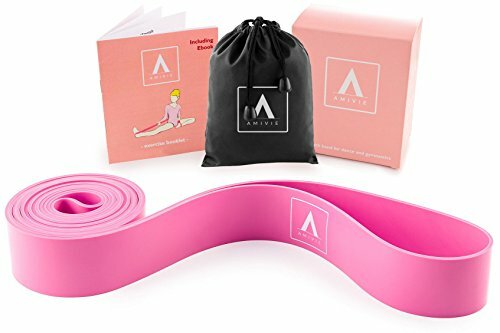 The heavy-duty resistance stretch band by Amivie is a valuable training tool which should be included in every dancer's dance bag, from teenagers to adults. Simple and easy to use, useful for ﬂexibility and balance exercises, the resistance band is convenient, safe and highly eﬃcient in improving your core strength and promoting ﬂuid, graceful movements. GET DEEPER STRETCHES ALL BY YOURSELF: Improve your technique and concentrate on position by integrating just the right amount of ﬁrm tension into your stretching routines. The seamless loop of premium, elastic latex provides hands-free stretching and the optimum muscle-building tension needed to progress. Thanks to this versatile training item, your stability, and balance will greatly improve. STRENGTHEN AND LENGTHEN YOUR MUSCLES: With a strong, secure, non-slip grip, you will be able to target your movements and obtain leaner muscles. Suitable for beginners and professionals training for dance shows, you can control the tension by shortening or lengthening the band. Durable and comfortable, the stretch band allows you to move freely and enjoy a wide range of motion. INCREASE YOUR COORDINATION AND FLEXIBILITY: Achieve better posture and form for all stretches, from basic ones to more advanced poses. Work on your pointe and arabesques and you will master your splits faster. Incorporate warm-up moves for your arms, legs, and feet and you can protect yourself from any injury or aid in successfully recovering from one. NEVER SKIP YOUR WORKOUT AGAIN: Compact and lightweight, you can use the resistance band in your home, oﬃce, hotel room or your regular dance studio. A must-have practice accessory for any classical or contemporary music dancer, gymnast or cheerleader, fold the portable stretch band and conveniently take it with you in the drawstring carrying pouch included. DISCOVER THE JOY AND FREEDOM OF DANCING: Find a rich collection of wonderful tips to help you navigate the exciting world of dance. Our included digital guide will oﬀer you valuable knowledge to support you in making the right choices for you and your body. Start working on a better, healthier you right now, you've already got the right information. If you have any questions about this product by Amivie, contact us by completing and submitting the form below. If you are looking for a specif part number, please include it with your message.